Sometimes, when they're having trouble getting it to look perfect or need to save time, a game's designer or animator might fudge a 3D model. A First-Person Shooter character might not have a proper character model, fast movement might use smears or a partially hidden character might have their model adjusted to make the visible parts stand out more. Scenery which is only viewed from one angle might be flat, even in 3D games (these are known as "Billboard Sprites"; see Sprite/Polygon Mix), and objects the player is meant to see but not interact with might lack their proper animations or logic scripting. Sometimes this stuff is sort of the real-time 3D equivalent to the Conservation of Detail: if the player doesn't see it, don't waste memory and processing power on it. It's what lets a game run without melting your computer- if you've got a laggy game that looks great, they dropped the ball here. However, if you end up seeing it (by accident or through cheats) Hilarity Ensues. With characters, skeleton rigs and mesh deformations get processed first- then the engine figures out what's on screen. That chews up processing power, so it makes sense to skip them if the Player Character is mostly seen from the first person perspective (as long as their arms and legs look right!). Parts of a world the player is nowhere near might be subject to "backface culling"note Which is the same thing that lets you see through objects when the camera clips through them: by telling the graphics engine to ignore the parts of a mesh the player shouldn't ever see (like the inside of the mountain or the other side of the wall), you slash the amount of stuff to render. ; taken to the extreme, the game might be told to never render objects the player shouldn't be near (like the inside of a mountain, or a building that has its interior stored as a separate level). You as the player will probably care more about the 5 FPS a dynamic spine rig would cost you than whether the bottom of the shirt looks a little funny in the two frames when you can sort of see it. This can also be used for aesthetic reasons or to implement something that wasn't intended to be in the game. An animation might look a bit better if the character goes a bit Off-Model for a frame or two. If a Game Engine only allows text boxes to be generated by NPCs, and the designers only want one or two readable signs in the entire game, it's easier to place an invisible NPC in front of a sign than to waste time adding signs to the engine proper. Objects in an FPS might be made larger, so they look right to the player, or animations that appear from off camera might only show the parts the player can see. Compare Behind the Black (when something hidden from the player's perspective should be obvious to the characters), Cheated Angle (when a specific feature is always seen at the same angle), First-Person Ghost (when an FPS character doesn't have a character model), and Hitbox Dissonance (when models and sprites don't match the mechanics). If these become visible in game it can cause Special Effects Failure. In The Legend of Zelda: A Link Between Worlds, every single 3D model is made to lean backwards in order to mimic the effect of the 3/4 View in The Legend of Zelda: A Link to the Past. In The Legend of Zelda: The Wind Waker, one Pro-Action Replay cheat code enables the player to hold a button to levitate. This can be done indefinitely (unless you crash the game). When climbing Dragon Roost Mountain, the player will pass through several doors that actually load new maps at the top of the mountain. Thus, if the player levitates up to the top of Dragon Roost Mountain from the overworld map, they'll find that the top of the Mountain isn't actually animated at all from above, and it's just a hollow, glitchy tube that allows the player to see all the way through to the ocean. Firewatch averts First-Person Ghost by showing your hands and body, but looking at the player model in third person reveals over-sized hands and under-sized legs to improve perspective. When Wario uses his Chomp move, the top halves of affected characters are shrunken to fit inside his mouth. This is especially noticeable if Wario is made invisible somehow. If a a fighter is inside the clay pot on the Garden of Hope stage while the Pikmin rebuild it, they become trapped inside, with their model shrinking to avoid clipping issues. A glitch (since fixed) can cause them to get stuck like this. Dragon Ball Fighter Z uses this to the extreme. In addition to deforming the faces and using character-specific lighting to replicate the look of the anime and coloured manga panels, parts of the body will be shrunk, squashed and enlarged to make for more dynamic animations in tandem with the camera, as shown here . Overwatch has smear animation in several places, which leads to memetic images when characters are frozen mid animation (for example, McCree when he's in the middle of a roll ). In Team Fortress 2, when characters' heads explode or are removed, they actually shrink away into their necks (covered up with a gore effect and with a separate severed head object spawned if needed). This is actually a highly common practice in FPS games involving decapitation. Unreal Tournament and TimeSplitters did it long before. Another common practice in shooters, especially by Valve Software, is to simply not model the side of the gun that wasn't on-screen to help save on framerate. This was mostly fine for games like Half-Life and Counter-Strike, but if you take the models into something like Garry's Mod and use those models for scripted weapons that have customization or ironsights or the like, you'll quickly notice how jank and "unfinished" the models can be. Mirror's Edge shows your body to help with immersion but features strange animations in third person (such as swaying violently at the waist when balancing). The animations were entirely made for the first person perspective, which means things don't really sync up well for the unintended switch. In Super Mario 64, when Mario is drowning in quicksand, his head expands (unseen to the player) so the top is visible. Otherwise, Mario's cap wouldn't be visible as he makes a Last Grasp at Life. Inversely, when Mario drowns in Super Mario Galaxy, his head actually shrinks down below the surface to not be in the way for Mario to do a Last Grasp at Life. Super Mario Bros. saved memory by making clouds and bushes the same object, but rendered different colours. Most objects in LittleBigPlanet don't have a back, because the game is a 2½D platformer. You can, however, use a glitch to twist objects around, revealing this. In Warcraft III the Acolyte and Sludge Monster units have their skins stored on the same file, so changing one will change the other. As the Acolyte sees a lot more use than the sludge monster, this can cause considerable surprise if the skin is switched using the editor. In Fallout, the T-51b power armour model in the intro cinematic was very clipping-prone at certain angles, as it was only needed for a handful of promotional stills, and for a quick animated appearance in a cinematic styled after grainy 1950s TV footage, where it was was shown from several metres away. This led to the armour being redesigned in Fallout: Van Buren, Black Isle Studios' cancelled version of Fallout 3, where the 3D model would have been an in-game asset available to the player. In Xenoblade Chronicles, the cutscenes do this a lot as they are only seen from one angle. Watching them with free viewing enabled reveals all sorts of nonsense , including Shulk's body disjointing. The main character in Outlast has no head on his model, even though the rest of him is for ease of decapitation animations. They get around this by him having an invisible head that still gets picked up by shadows. You can actually see the neck hole in the cutscene where he climbs into a dumbwaiter. Discussed in some of the examples of this Cracked article. 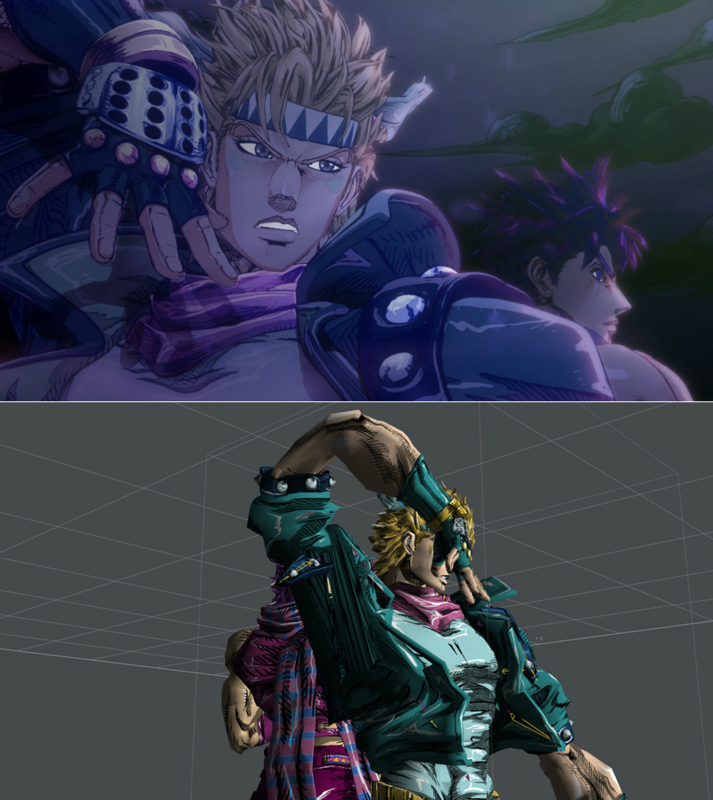 One commonly circulated image ◊ reveals that in the OP for JoJo's Bizarre Adventure: Battle Tendency, Caesar Zeppeli's arm is unrealistically stretched to achieve a pose for a shot. When Elsa is Letting Her Hair Down during "Let It Go" in Frozen, her braid actually passes through her arm. The animators admitted that they cheated since the animation for having them collide didn't look nearly as good.